The Fitzroy Tavern – arguably the most famous pub in Fitzrovia (and a few minutes’ walk from Davis Brown – arguably the most famous Estate Agents in Fitzrovia..), started life as the Fitzroy Coffee House in 1883. It was later converted to a pub named The Hundred Marks, so-called due to the many German immigrants living in the area. 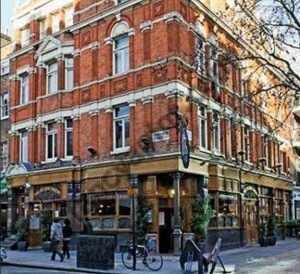 The pub re-opened as the Fitzroy Tavern in March 1919 and gives the area of Fitzrovia its name. Back in the day in the 30s and 40s it was a Bohemian hangout with writers, artists, composers, sculptors & poets all frequenting the pub. Apparently, the deal was if one of them sold an article/painting/sculpture or any other talent was peddled they would then all be in the money – until it lasted, and then become broke again until another one got lucky. George Orwell, Dylan Thomas and George Bernard Shaw – all locals of the area were bound to have raised a few glasses in here. Fitzrovia no longer has that Bohemian air about it and has been given over to media types, but still has some of the best old school pubs in London. So if you’re in the area and fancy a good old fashioned English pint in a pub full of character and rich history then it would be well worth your while to pay The Fitzroy Tavern a visit. And being favoured by us here at Davis Brown Commercial Agents you may well bump in to one of us there too! Mayfair is roughly a square, cornered by Marble Arch, Oxford Circus, Piccadilly Circus and Hyde Park Corner. It is edged by four of London’s most famous streets – Park Lane, Piccadilly, Regents Street and Oxford Street and is probably one of London’s most well-known areas, even if you’ve never been, you are sure to know it from the Monopoly board! II.Piccadilly was named after a kind of stiff collar made by a tailor who lived in the area in the 17th Century. V. The Duke of Edinburgh held his stag do at The Dorchester! During World War Two, heavy bombing in Central London forced many businesses to re-locate their offices to Mayfair. These businesses have remained in the area ever since, however recently the Grosvenor Estate has sought to regain the areas original character and gradually properties are being converted back into their original residential state. Furthermore, rigid regulations on retail space has created some of the most unique and luxury shopping streets in the City. Mayfair has Bond Street, Piccadilly, Burlington Arcade and Mount Street – where some of the most famous brands and independent stores world over call home. Mayfair has five tube stations within it, providing access to each corner of the square. Bond Street offers Jubilee and Central Lines, whilst Oxford Circus also has the Central, along with the Victoria Bakerloo Lines. Green Park offers connections to Heathrow and also runs directly into the international rail terminal at Kings Cross. Finally from Hyde Park Corner and Marble Arch, one can access the Piccadilly Line as well as the Central. By road, the A4 (Picadilly) is a major connecting road, which becomes the M40 to connect with the M25. As with all of London, there is a selection of buses available from Mayfair and users can hop on and hop off easily. As estate agents in Fitzrovia, we tend to walk to Mayfair. The area has some wonderful side streets (and shops!) and on a nice day there’s nothing better than to take an amble through the streets of Mayfair. If you are looking for exclusivity, Mayfair is the place to head. Located within the area are some of London’s most prestigious and finest private members clubs such as the famous Birley’s and Annabel’s. If you are not a member, but are still looking to go upmarket and treat yourself without the membership, then The Ritz for afternoon tea is a must. As one of London’s most famous hotels, it’s the pinnacle of silver service in the city and is synonymous with the area. For those of you looking for something a little more culturally stimulating, the Royal Academy on Piccadilly has a fantastic calendar of exhibitions alongside their outstanding permanent collection and there is always something new to see. As estate agents in W1, we like to walk to our viewings in Mayfair. The area offers not one but three parks – Hyde Park, Green Park and St James’sPark are all local and have activities and events year round including tennis, riding, biking and even boating! One for the boys is Saville Row. Built in the early 1700s with the Burlington Estate, Saville Row is famous world over for offering the best in traditional British men’s tailoring. Whether you are looking for an outfit for a special occasion, or simply fancy a look at the different stores, Saville Row is an essential visit for the discerning gentleman! It is virtually impossible to eat in Mayfair and not splash out. With an exhaustive selection of high end restaurants, you’re spoilt for choice! Robert de Niro’s Japanese restaurant Nobu is situated on the first floor of the Metropolitan Hotel and serves divine food alongside an extensive wine list. For the fish lovers, Scotts in Mount Street is definitely worth the visit. With stunning interiors and a large and varied menu, there is something for everyone. Oysters and champagne are the speciality here and you’ll be hard pushed to find better in London. Lastly Gordon Ramsay at Claridges is perfect for those who are looking for the best service around. Cameras in the restaurant ensure that this Michelin star restaurant has the quality service to match their food. Make sure you book in advance however as this French food restaurant gets booked up well in advance! The Connaught Hotel is the perfect place to meet. Two bars in the same building mean you can take your pick on arrival between The Connaught Bar and The Coburg. Plush seating in this stylish and glamorous hotel gives it an intimate feel, and a true highlight is their famous Martini, served to you on a trolley and mixed in front of you! Property: what does the area have to offer? As you would expect from one of London’s most upmarket and stylish areas, Mayfair is peppered with beautiful mansions, pretty mews and stunning apartments. As the switch back to a residential area continues, there is more and more property coming to market. If you are looking for a sweet mews house, check out Hays Mews or Adams Row. However if grandeur and space are more your thing, take a look at the large apartments on offer in Park Lane, or the stunning period houses in Park Street. If you would like to find out more about property in Mayfair and W1, please contact Davis Brown estate agents. Marylebone – SNIPPETS OF HISTORY FROM THE WORLD’S GREATEST CAPITAL CITY! Another of the areas covered by Davis Brown Commercial Agents and Estate Agents W1 is Marylebone. Yes it’s a bit of a mouthful and it’s been pronounced in many different ways (we personally use 3 syllables). The name “Marylebone” is actually an abbreviation of its 14th century name of “St Mary by the Bourne”, relating to St Mary’s Parish Church which was built on the banks of a small stream – or “bourne”. In 1965 Marylebone amalgamated with Paddington & Westminster to create a new, large City of Westminster. The area is home to numerous spacious late Georgian town houses which have always been attractive qualities for many people including us at Davis Brown Marylbone estate agents. Famous names such as Lord Byron lived in Holles Street, Charles Dickens was a resident of Devonshire Terrace until his tenancy expired in the Autumn of 1851 which is when he took up residence in Tavistock House. The most famous resident of Marylebone however– albeit fictional – must surely be Arthur Conan Doyle’s Sherlock Holmes! The street he lived in with his side kick Dr Watson was of course Baker Street which must be one of London’s most famous streets, even being immortalised in song! Like most areas in London Marylebone has a colourful past, Nightingale Street (now Gateforth Street), was one of the most notorious in the area; it appeared on one of the Booth Poverty maps from 1889 where the streets were colour coded to indicate their status; Nightingale Street was “awarded” the colour black, denoting the lowest grade and that “semi-criminals” lived here. I wouldn’t have imagined that Davis Brown estate agents would have had many dealings in this street! Marylebone also has many diverse institutions such as Lord’s cricket ground, Madame Tussaud’s, the London Planetarium and has also been home to an abundance of animals from all over the world since 1828, as this is where you will find world renowned London Zoo! Our next coffee shop certainly didn’t start life as a coffee shop. Oh no –far from it! The Attendant in Foley Street, W1 is a tiny, coffee bar close to Davis Brown Estate Agents in W1 and situated within an old Victorian loo no less! Now it may not be everyone’s cup of tea (pun very much intended) but it certainlyadds to the character of the area with a great story to tell – attracting tourists and locals alike. It was originally built around 1890 and has kept some of its important features. Two years of planning and restoration has turned this space into a cosy underground area where you can enjoy your macchiato and cookie dough brownie while your surroundings take you back in time, with the original Victorian floor tiles and urinals lovingly restored. The trend for turning old public conveniences into bars or cafes are becoming quite popular around London – one in Clapham Common aswell as Shepherd’s Bush and Kentish Town to name but three. It’s a resourceful idea and being commercial agents in Fitzrovia we are keen to keep our eye out for all manner of unusual and quirky establishments – they all add to the charm of our oh so fabulous city! 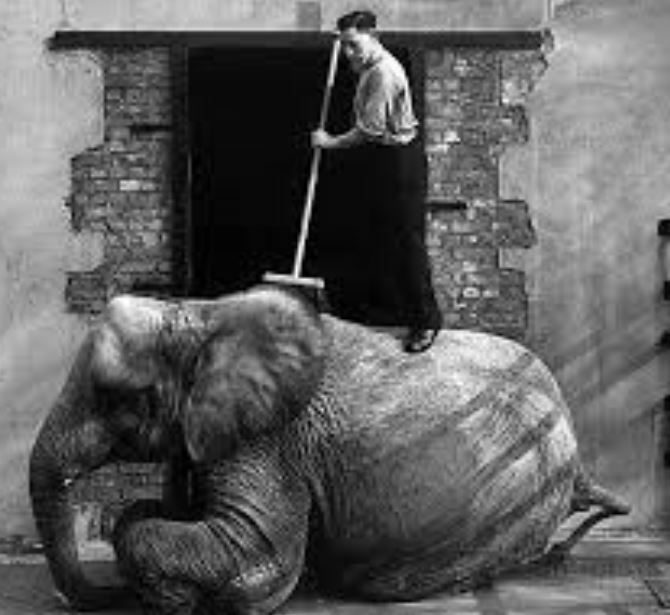 Get a load of Getty Images Gallery! London has a plethora of weird and wonderful things to fill your spare time with and as estate agents in W1 we often find ourselves exploring when we have a few minutes in between appointments. One of those wonderful things being art galleries; we’ve all heard of the likes of the Tate Modern, National Portrait Gallery and Saatchi Galleries, but, if you look a little closer you will find plenty more smaller but just as fascinating galleries tucked away in the back streets. The sheer abundance of world class artworks on display in London will inspire even the most discerning art lovers! One such gallery, just around the corner from Davis Brown estate agents is the Getty Images Gallery in Eastcastle Street. Housed in a modern, light, white space this gallery offers iconic imagery in the form of beautiful photographs, including faces that have defined our times and landscapes and interiors to inspire. The gallery showcases exhibitions on a regular basis so there will always be something new and exciting to have a nose at here. It’s a minute’s walk away from the hustle and bustle of Oxford Street, plus has the bonus of no admission fee! So why not grab yourself a dose of culture? 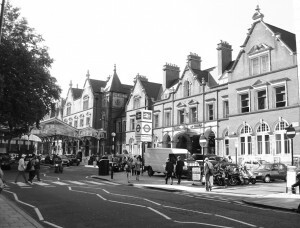 Marylebone is one of the most famous areas of London and has an exhaustive amount to offer residents. Whether you are looking to spend the day viewing tourist sites like Madame Tussauds, or have a stroll around one of its many parks, Marylebone has got it all. As all estate agents in Fitzrovia know, property in Marylebone is extremely varied and with large residential areas there is something for everyone. As all estate agents know, Marylebone is situated in the heart of the W1 and comes under the City of Westminster. It is bordered by Oxford Street to the South, Marylebone Road to the North, Edgware road to the West and Great Portland Street to the East. However, some estate agents consider Marylebone as a broader area, encompassing Regent’s Park to Dorset Square and even as far as Lisson Grove in St Johns Wood. Marylebone was named after the St Marylebone Parish Church which was dedicated to Saint Mary. The church was located on the banks of a stream called the Tybourne which ran along what is now known as Marylebone Lane. Over time, St Mary at the Bourne was shortened and shortened until it became ‘Marylebone’ – the term that we know and use today. Residents of Marylebone have easy access to excellent transport links with 8 tube stations, plenty of bus routes and Marylebone or Paddington mainline stations. You can hop on a tube in Marylebone and have access to the Bakerloo Line, Jubilee Line, District Line, Circle Line and the Hammersmith & City line which for us estate agents based in W1, it’s very useful! There is never a boring moment in Marylebone. At the heart of this area is Marylebone High Street, full of cafes, restaurants and boutique shops. It’s a wonderful place to take a stroll down and whilst only a short walk from Oxford Street, it is far quieter. For the tourist in you, there is Madame Tussauds, the Sherlock Holmes Museum, London Zoo…to name a few! Finally for those of you into your art, there is the famous independent A and D gallery on Chiltern Street – a great place to spend the afternoon before heading out locally for some dinner. Dating back to 1914, fish and chip shop Golden Hind is a Marylebone must – this quintessentially British dish is served here to perfection – we thinks its best eaten on the grass in Regents park on a nice evening. 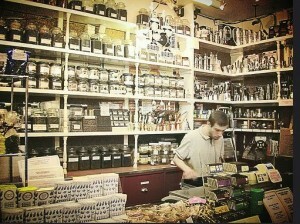 Marylebone also has a wealth of food shops such as La Fromagerie, which was hailed as ‘one of the best’ cheese shops in England by Tatler Magazine. If you are planning a dinner party or just want to treat yourself to a dinner in, the award winning Ginger Pig butcher has won several awards for its meat including an accolade in the Observer Food Monthly awards. For families there is a selection of schools within close proximity such as Wetherby Preparatory School for boys and Queen’s College for girls, along with lots of activates and outside open space with parks such as Regents Park close by. For professionals, the extensive transport links in Marylebone serve most of London so you’ll be sure to have an easy journey, wherever you are commuting to. If you would like to find out more about property in Marylebone and W1, please contact Davis Brown estate agents. The Cream of the (coffee bean) Crop! Being hard working Estate Agents in the heart of W1 – the need for caffeine in our office is above average! Hence we are well versed in the area’s growing number of coffee shops and of course have our favourites. 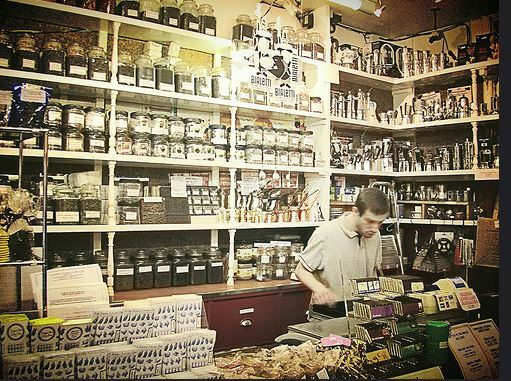 But unassumingly nestled in the heart of Soho there is a coffee shop which opened it’s doors no less than 128 years ago and has evolved to become one of the world’s best known suppliers of coffee (and tea!). As Chartered Surveyors we love all sorts of buildings – modern and old, and this one piqued our interest as it still retains some of its original features such as the wooden shelving along the walls, as well as the original wooden counter and display case, all dating back to 1887 – this is not your generic coffee shop! Come and visit us – your friendly Estate Agents in Fitzrovia, then go grab yourself a coffee at the easy-on-the-wallet Algerian Coffee Store – a spot of history for locals and tourists alike. 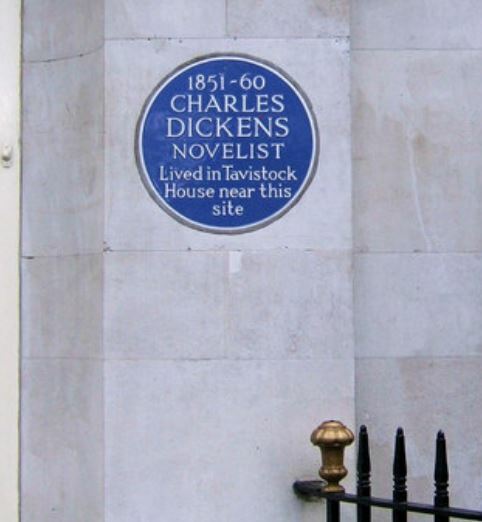 Bloomsbury – Snippets of history from the world’s greatest capital city! Bloomsbury – an area the estate agents at Davis Brown know only too well – is a rectangular area bound by Tottenham Court Road to the West and Gray’s Inn Road to the East. It was developed from the late seventeenth century and has long been associated with the Bloomsbury Group – a bohemian set of twentieth century artists, writers and intellectuals. With this in mind those little blue plaques were always going to be aplenty around these parts! In Denmark Street – AKA Tin Pan Alley for its association with the music industry – lived Augustus Siebe and he resided at number 5 from 1828 til 1872. Unless you have the knowledge of someone from University Challenge you will be unlikely to know that Augustus was the pioneer of the diving helmet – random I know, but extremely important for those divers none the less! In Great Russell Street lived Thomas Henry Wyatt; he was a designer of country houses, notably the church at Wilton in Wiltshire which was built in the Romanesque Basilica style (and of great interest to our Chartered Surveyors). It was the largest Anglican church to be built for one hundred years. He lived here from the 1840s until his death around 30 years later. There are 8 plaques in Bedford Square; Henry Cavendish lived at number 11 (aswell as another residence in Clapham Common) from 1784 until his death. He was a natural philosopher and the most experimental physicist of his time. He lived here with three servants and usually only communicated by written notes! 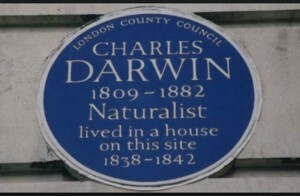 Charles Darwin (who needs no introduction) has his plaque at the site of number 110 Gower Street which is now the modern Biological Sciences Building of University College London. Some of the workings of this great man’s mind I hope are being passed on to the students who now study in the spot where he once studied. He moved here in 1838 until he became ill and moved in with his family elsewhere in Kent in 1842. Plenty more writers, painters, philosophers, artists and the like lived here. 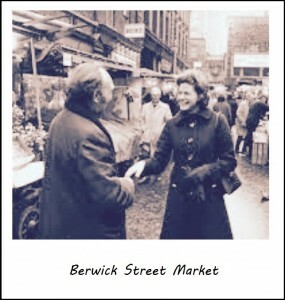 Feel free to pop in to us at Davis Brown for a coffee and a chat about an area we know so well. Monday morning pick-me-up – Fabulous flatties! Flat lining at work on a Monday morning? Then drag those tired bones of yours to Flat White coffee shop on Berwick Street, Soho – a hop and a skip from Davis Brown Estate Agents – for a “flattie” (this is an Antipodean establishmentso let’s join in with the lingo here). FYI, the Flat White was apparently invented in Auckland, New Zealand in 1984 and is prepared by pouring a velvety microfoam (google it) over a single or double espresso. 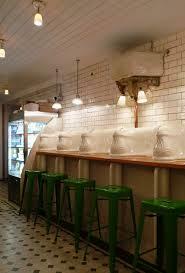 Flat White was established in 2005; it’s a cosy little place situated at the cobbled end of Berwick Street. Nothing too exciting about its interior (except for the magic that happens at the hands of the barista), and there is no wi-fi, so close your laptop and park yourself – coffee in hand, on one of their benches placed outside the front and watch the world go by on this great historical road in Soho and imagine what once was. The southern end of the street was bombed in the blitz during WW2, but several of the remaining buildings date from the 1730s. The antique lighting shop W Stitch & Co is indeed the oldest shop in Soho, and the Green Man pub occupies a site that has been a tavern since 1738. For commercial agents like us, our fascination for the area can leave us wide-eyed and in awe, so it’s not unusual after a viewing to find one of our estate agents pounding the cobbled pavements, flattie in hand, soaking up the history. We strongly suggest you do the same!